It's incredibly simple to set up and is currently programmed to allow you to zap data from new diary events, contacts, and office tasks into third-party apps. Right now the Commusoft integration is by invitation only, so please get in touch with us via support@commusoft.co.uk and we will send an invitation over as soon as possible. If you're wondering what on earth we're talking about, zapping this and zapping that, no problem. Let me first tell you what Zapier is. Zapier is an online automation tool that connects over 1,000 different apps together. This lets you automate tasks without any coding and without developers creating specific integrations. You can get a free account (with a limited number of workflows), as well as premium accounts for larger businesses. With a few clicks you can connect the apps you use on a regular basis, like Google Calendar, MailChimp, Dropbox, (and many more) to create new custom workflows. For example, every time you get an email with an attachment, Zapier could automatically download that file and send it (or 'zap' it ⚡) to your Dropbox account, without you lifting a finger. Now that Commusoft integrates with Zapier, you can easily create zaps that are triggered by your Commusoft account. 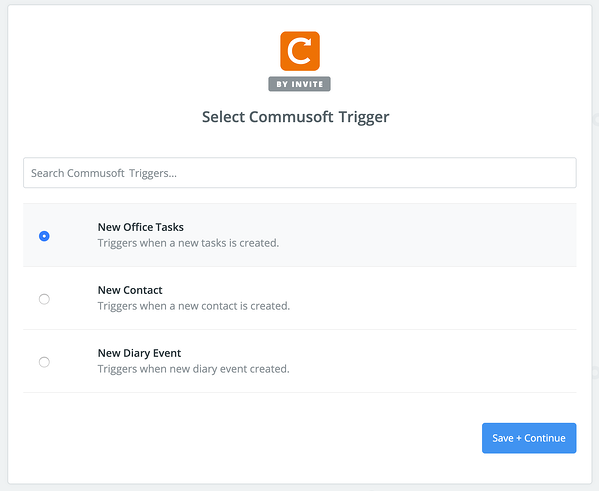 Once you've been invited to use the Commusoft integration, you'll be able to create triggers based off of new office tasks, new contacts, and new diary events. This means that whenever one of these triggers occurs within your Commusoft account, Zapier can respond with an action of your choice. After you've select the trigger you wish to use, you'll need to set up the response. This could be an action in any third-party app that works with Zapier - the choice is yours! Let's check out what that might look like in the example below. 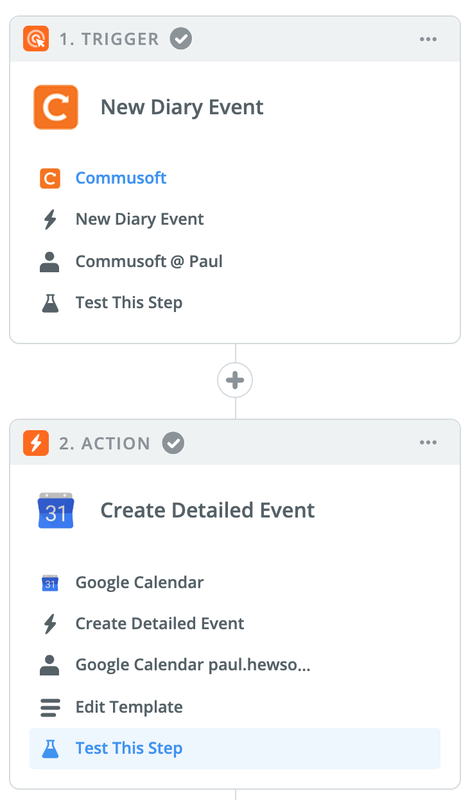 You can see here that we've created a zap with 'New Diary Event' as the trigger, linked to Paul's Commusoft account. Below that is the action - what Zapier will do when the trigger occurs. In this case, Zapier will create a new event in my Google Calendar account. This will zap the date, start and end time, and description from Commusoft into Zapier - it's completely automated, so I just need to let it run. That's just one example. You can create numerous interesting workflows that fit with your business needs and apps. Please note, you cannot zap data from third-party apps into Commusoft. The integration only works with Commusoft as a trigger, not as an action. 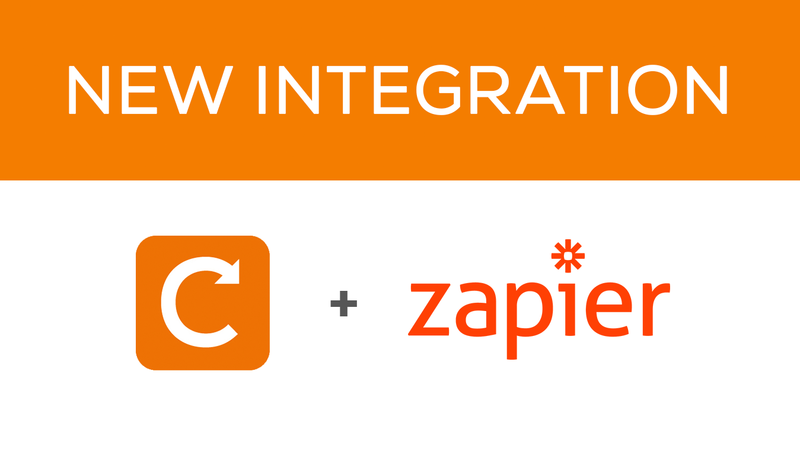 The Zapier and Commusoft integration is currently by invitation only. Once users start creating workflows, Zapier will make the integration available for everybody. So that means if you wish to get started and set up a Commusoft zap, you'll need to contact us first. Simply email support@commusoft.co.uk to let them know and we'll send you an invite. Are you happy with the work we're doing? We'd appreciate it if you let us know in a review - we love reading your feedback! You can review Commusoft here.